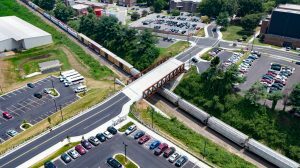 DAVENPORT provided a feasibility study, roadway and parking design and railroad coordination for a railroad crossing at Winston-Salem State University (WSSU). 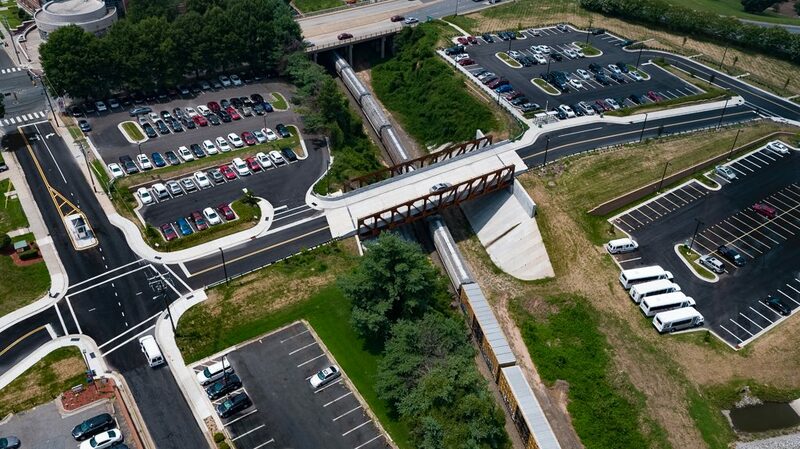 The university’s main campus and targeted area for expansion are bisected by Norfolk Southern Railroad, and they needed a feasible, safe and cost-effective crossing design to connect the two areas. DAVENPORT was first hired to study the feasibility of various crossing alternatives. The firm’s analysis included evaluation of four different alignments, one crossing under the railroad and three crossing over it. The below-grade alternative was quickly ruled out due to cost, and the above-grade alignments were studied further. Among the many project challenges was a significant grade change (a 40-foot drop spanning only 1,500 feet of roadway), on Cromartie Street, the main campus drive. Locating the crossing at the top of Cromartie Street (before the drop) was preferred, because it would minimize the height of the bridge; however, there were more traffic issues to mitigate at the top of the street due to its proximity to an NCDOT roadway. Some alignments were eliminated due to conflicts with buildings, driveways and parking lots. After determining the best alternative to balance the topography challenges, traffic operations, existing campus infrastructure and the needs of WSSU, DAVENPORT worked as part of the design team for the crossing, as well as a new roadway and parking facility on the north portion of campus. The project includes a design of a new roadway on the north portion of the campus with connections to both Lowery and Cromartie Streets. DAVENPORT provided design services for the roadway and modified the existing parking lot. The scope of DAVENPORT’s work included typical sections, roadway plans, storm drainage plans, pavement markings and signing plans. DAVENPORT also helped to coordinate with Norfolk-Southern Railroad for the construction of a new 124’ span vehicular bridge across the railroad right-of-way running through the campus.